Thanks for clarifying about buldings / ruins / ruined buildings. I wasn't aware that runied buildings could not be "ruined" as a building could. I'm unsure of what to think about destroying and removing buildings. I have not done much Close Combat since getting back into 40K so I am not overly familiar with assaulting through cover, and the impact this has on each army / troop choice and I don't have the knowldege / experience of how that would play out over time. I've spent a large part of the last year thinking about making various types of terrain for my games, and whenever I try to imagine making buildings and then making ruined versions of those buildings, and even making craters of those ruins (Epic! Right? ;P ), I end up getting caught with uncertainty when I start to think about the actual process of removing scenery mid game and removing and replacing figures etc. If it was used often and easily it would sadden me to think of future games where players blast and remove most of their opponents defenses before bringing their weapons to actually target the enemy. It would leave a lot of games ending with nothing but craters everywhere and a vast open battlefield. 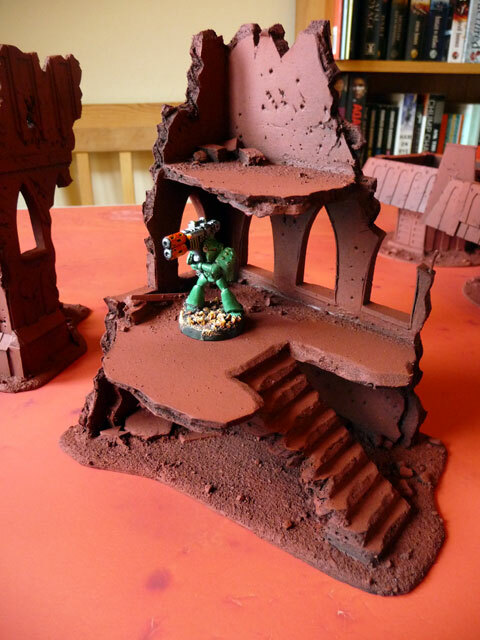 This has an appeal, and is something I'd be happy to play, once ~ maybe :) (something I could use my box of 50 resin craters for... :D) But I would not want the game to become something where a table of craters was the norm. It would remove a whole layer of the game, which is to "move around the battlefield" tactically. It makes it hard for my brainnoodle to go through the process of what games would be like when you can remove "any piece" of scenery. Maybe it's because I like things to look as good as they can be, and would find it counter intuitive to have sections of scenery marked with a dice to represent that they are "not there anymore". I guess the balance to this is that buildings can be reduced to ruined buildings which reduces their effectiveness, but stops them from being removed entirely thus leaving a barren board....? Most games I play/scenery I come across does not have a lot of buildings. Buildings are treated nowadays much like static tanks, they have a transport capacity and fire ports. GW terrain kits are predominantly ruins, although you can also get the various Fortifications that come as 'buildings'. Ruins themselves are little easier ruleswise and although you get a benefit from cover a fully functioning building offers more advantages hence why ruins are more common. However since 6th Edition allowed you to purchase Fortifications to help create defensive positions you do now find the likes of a Bastion, Bunkers, Fortress of Redemption and numerous other paid for buildings to protect your army. They are actually quite difficult to damage and due to their static nature you're unlikely to see more than one in your opponents force. So a game may see a building blown up first turn [which does mean the rest of your army may go unscathed] or it could survive the entire game, it depends on how much high strength weaponry your opponent has. I wouldn't be too concerned about removing buildings, if you've got 50 resin craters and make a debris field that covers the same area as the building that should suffice. Additionally the new Stronghold Assault rules give you the option of a number of more Defensive Fortified scenarios that offers you the opportunity to have lots of Fortifications but most games won't include anything more exotic than a Bastion as a 'building'. Having said that though, and felt that way for many years ~ I can remember (read: Just remembered with the intensity of a punch to the brain) my early games where my Space Marines would take some Squat allies so I could use my Mole Mortars. The excitement of my oppositions defensive terrain which was most likely elevated, and/or Hard Cover (-2 to hit) being removed and replaced with a (painted one colour brown cereal box and paper mache) crater (Soft Cover -1 to hit) was great fun and a good battlefield tactic. Changing the battlefield to my advantage was something I used back then as much as my troops and Wargear. Changing the battlefield was the extra layer of Chess-like tactics that I really enjoyed. It was an extra layer on top of army composition (the usual choices such as troop choices, Wargear, Psychic Powers etc) that could have a dramatic impact on the battle. I would often use what I called "Blockers" such as Blind and Plasma Grenades (both of which had an area affect, stayed in play, blocked Line Of Sight, and generally had the possibility of a negative penalty for being near) and also the Psychic Power "Ecto-Plasmic Mist" (which blocked LOS and slowed movements down) and even a Vortex Grenade on one side of the map, to block or provide a risk to the enemy, thus channeling them in a direction that was more in my favour. But, this was back in the day when we still pretty much used unpainted white polystyrene (the type you get around new TVs / Stereos etc) for all our terrain needs, and we even broke it up and broke off bits as it was destroyed. Maybe it was when I started making decent scenery that created a great battlefield to play on that I stopped being aware of the aspect of destroying buildings so much. Losing access to Mole Mortars as the Squats never got updated like all the other armies did would of aiding in not thinking that way anymore too. Losing the "stay in play" affects of Blind and Plasma grenades, and losing Ecto-Plasmic Mist and other area affecting Psychic Powers would of also helped to dust over those thoughts. I don't even think you can get Vortex Grenades at all anymore? So I think over time my "extra layer" of using the battlefield tactically like I did has been lost to the Warp. I used to love anti-plant grenades - watching your mate set up his army in a soft cover wood and then completely remove the trees around him - priceless. There are still Vortex weapons, but they're few and far between thanks to their impact on the game. I'm sure there are other unique rules that would have a similar effect but there are so many rules for different armies I can't think of anything specific. There are rules for mysterious terrain/objective though, it's optional but does add a little more excitement. Some objectives can be sabotaged, meaning they may blow up on 1 each turn if your army is stood nect to it. Or it could be an anti-aircraft targetting array that allow you to shoot down flyers. Some of the terrain has other effects, like being the roost of Razorwings, which when you enter the forest will attack you. In some games I've lost more models to Razorwings than my opponents weaponry! There are a number of extra layers like this, the new Psychic Phase can be pivotal or a complete bust depending on the dice. There is also wargear and unique rules that can add that extra layer, but quite often I find these highly situational and I'm not fond of spending points on something that willl only work if a model is killed in close combat by a weapon that is twice as sstrong as the creature is tough! There are some armies though that I think get too many of these buffs. Necrons for instance, even though quite an old Codex seem to have access to all sorts of things so they go beyond being a 'jack of all trades and master of none' to just being a 'master of all trades'! There is indeed a lot that has been lost but there is a push by GW to retain the 'cinematic' feel and 'forge a narrative' so they openly recommend adding in rules that your and your mates agree will add more value to the game. Or, even add a GM, someone who controls the flow of the game and can whip up a scenario worth fighting over. Ultimately if you've still got that Rogue Trader ethic then play it how you want. Of course playing outside your circle of friends you may have to stick to the rules more closely, but it's your game you should enjoy it how you feel. No apologies necessary, as you read the blog you'll see rambling structure is very much a pre-requisite! ;) Yeah I've had plenty of comments disappear on me and that second time around seems so much less cohesive and sensible, but I want to thank you for persevering, it was a great read and I hope you enjoy the hobby anew and you imagine all my responses equally amusing and smart aas your original replies that were lost to the warp, ha, ha!